Appel à participation de tous ! 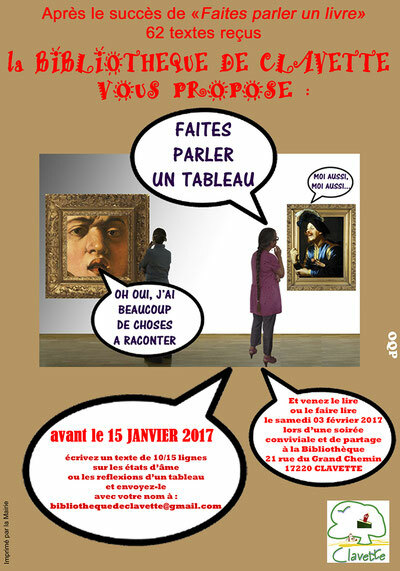 Faisant suite au succès de la première "Faites parler un livre" (62 textes) début 2016. Des livres ont parlé au travers l'imagination d'enfants de CM1 et CM2 jusqu'à la doyenne de 86 ans en passant par des prisonniers de la maison centrale de Saint Martin de Ré, un académicien de l'académie de Bretagne, un ancien directeur du Point, des journalistes de France Télévision et ceux qui ont pu être présents ont lu leur texte lorsqu'ils le souhaitaient, les autres ayant été lu par les "Croc'Mots" (groupe de 10 bibliothécaires en réseau faisant des lectures théâtralisées). It is with pleasure that I will develop the subjects you want. Hi, I would like to subscribe for this website to take most recent updates, thus where can i do it please help out. Thank you for your interest, if you dare to follow our news, it might be good to put our page in your favorites until we have a newsletter. Est-ce que je peux vous répondre en français ? Hi, its pleasant article on the topic of media print, we all be familiar with media is a impressive source of information. I'm gone to tell my little brother, that he should also pay a visit this weblog on regular basis to get updated from most recent reports. Thank you very much for your interest in us. If I answer in French, is that okay? My coder is trying to persuade me to move to .net from PHP. I have always disliked the idea because of the expenses. But he's tryiong none the less. I've been using WordPress on several websites for about a year and am anxious about switching to another platform. I have heard excellent things about blogengine.net. Is there a way I can import all my wordpress content into it? Any kind of help would be really appreciated! I am in fact happy to read this blog posts which includes plenty of valuable information, thanks for providing these information. I blog often and I genuinely appreciate your information. The article has truly peaked my interest. I am going to bookmark your website and keep checking for new details about once per week. I subscribed to your RSS feed too. Hi! I know this is sort of off-topic however I needed to ask. Does operating a well-established website like yours require a lot of work? I am completely new to running a blog but I do write in my journal everyday. I'd like to start a blog so I will be able to share my personal experience and thoughts online. Please let me know if you have any ideas or tips for brand new aspiring blog owners. Appreciate it! Wonderful goods from you, man. I've understand your stuff prior to and you are simply too excellent. I actually like what you have got here, really like what you're stating and the best way by which you assert it. You are making it enjoyable and you still take care of to stay it smart. I cant wait to read far more from you. This is really a great site. Merci, c'est très gentil, mais je suis curieuse de savoir comment vous nous avez trouvé ? Merci pour votre prévenance, pouvez-vous nous en dire plus ?